Hi there, folks. My name is Igor. 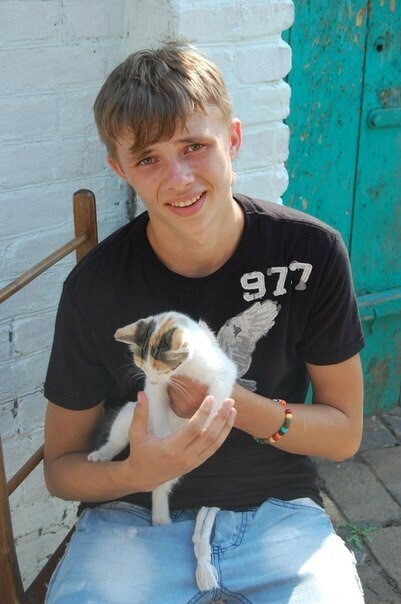 I moved into the Kramatorsk Adaptation center summer of 2012 when Maxim, the Center ministry leader invited my friend and I to attend a Christian youth camp. Since that time, there have been a lot of changes in my life, and I’m grateful to the Lord for all that He’s done for me. When I first moved into the Center, I was very angry, blowing up at the slightest provocation; I was a proud person and trusted no one – but the Lord took my life into His own hands and began to change me. The first miraculous change I saw God make in my life was His freeing me from smoking and cursing. That was enough evidence for me – I became convinced that God really was interested in life. He cared about my problems, He cared about the things that were hard for me, and He even cared about my never-ending questions. Another miracle: The Center where I lived with Maxim and Lena was nice and roomy, but the bedrooms we lived in were in need of repair. When fall and winter came, those rooms were very cold. All of us guys living there started praying that God would help us find a solution to this problem. In a very short period of time, we were witness to another miracle – our rooms were completely renovated! People came to help from different churches: one person painted, another plastered the walls, a third put up wallpaper. (We even had American teens that came and helped!) I took part and helped out as I could, and I ended up learning a lot. Our rooms were soon so changed that they were unrecognizable as the same place we’d lived in not long before. There were new beds, nice wallpaper covering the walls… it was great! We were even given a new furnace. Men from church came and rebuilt our radiator system, and our house was soon very warm and comfy. (I’m learning to be a professional welder; so helping out with the heating system repairs was great practice for me.) In a very short period of time, all these people that came to help us became as close as family. All in all, it was a really great time. And yet another: For the longest time, we were looking for a place to work. I needed to find a job where I could get experience in the profession I’m studying for (welder) in the local vocational college. Once again, I saw God provide in a way that was just miraculous to me: we were given jobs in a factory! Not only given jobs, but the people we work with are so nice - they treat us as if we were their own children, their own flesh and blood. Praise the Lord! I’ve always had a hard time doing anything resembling work, and when we first began taking turns with cleaning around the house and cleaning up after meals, it was definitely problematic for me. Very often, it ended in arguing and unpleasantness. Today, I look back and am just amazed – why was my life like that? We’re working at the factory, and at home, with no problems. We all take turns cleaning, we help Lena cook meals, we’ve come to love having things neat and clean… we’ve even learned to make bread from scratch. Before I came to live at the Center, there really was nothing to my life aside from alcohol, cigarettes, TV, cursing…and friends who had similar interests. The Lord brought me to Himself, forgave me and made me a part of His family. Before, it seemed like I was always being deceived and betrayed – but I know that God will never deceive me. Now I’m a member of our church; I was baptized last summer and the Lord baptized me with his Holy Spirit. I’m working with the youngest age group in our church Sunday school and going on evangelistic outings with our church youth group. At the Center, we read the Bible and pray together as a family every morning. The other guys and I have a prayer time together every evening, and we go to our church’s Youth Bible studies and fellowship times. I have a great love of cars and deep down have always believed that one day my dream will come true and I’ll be able to have my own car. However, as a kid, I didn’t know that I needed to give my dreams to the Lord – placing them in the hands of the one who has loved me and known everything abut me from the moment I was born. I gave my dream of having a car to the Lord, I poured out my heart to Jesus. Today I have a car! Of course, it does need work, but I’m confidant that I can fix it up and it will be a real help in serving others for God’s greater glory. In the future, after I’ve finished vocational school, I want to go to Bible College and become a missionary. I firmly believe that I will have a wife and children, that I will have my own family, that I’ll be a father. I will tell my children how much God has done for me. He is a great and wonderful God, so often we need just to hang in there and wait in Him in faith, and we’ll see miracles happen. I want to thank and praise the Lord once again for His wonderful working in my life. I’m also grateful to Agape Ministries. God has worked greatly in my life through your ministry – thank you for the Adaptation Center, thank you for your love and prayers.